It’s been a while since we last updated our website, for which apologies to our regular visitors. That doesn’t mean we haven’t been busy! Through the winter we have been working on some new material at our weekly practices, as well as polishing old favourites. (Our practices are held every Wednesday in the Bere Ferrers Social Club at 7.30 and visitors are always welcome, especially if it increases the bar takings. )The other regular feature of our lives is performing at Acoustic Night at our local pub, the Olde Plough in Bere Ferrers. This happens on the third Sunday of every month starting at 8.30pm, and there is always an array of local talent on view, as well as the Tavy Tars. 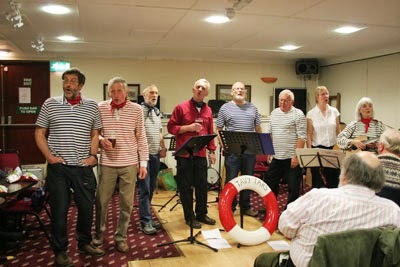 Looking back over the last few months, we got off to a flier with a return to the St Germans Sailing Club for an RNLI fundraiser at the end of January. This is such a glorious venue on the banks of the River Lynher and the people are so kind and welcoming. The only difference this time was that we were indoors rather than performing on the riverbank-but it was cold, wet and dark outside, so no, we’re not going soft! In April we were at the Tavy Club in Tavistock, which is becoming another favourite venue. We had been asked to organise an evening of folk music as part of the Tavistock Music Festival. The Tars did two sets to open and close the evening, but we had invited lots of performing friends including Tony Rose, Squandered Youth, Ferrers Reel, Roger (ex-Hanging Johnny) and Mike and Tilly (A Bit on The Country Side Lite! ), so the enthusiastic audience had lots of variety to enjoy. Most recently, we were at Jolly Jacks Restaurant at the Mayflower Marina in Plymouth on the 8th May to entertain the participants in the Old Gaffers Rally. This group of hardy sailors of traditional gaff-rigged vessels were visiting Plymouth for a few days as part of a Round Britain voyage which will continue through to August. Sadly we weren’t invited to join them for the rest of their trip, but we had a great night and so did the 150 or more folk enjoying the hospitality of Jolly Jacks. Lots of Old Gaffers were clearly knowledgeable about their sea shanties, so we were kept on our toes! 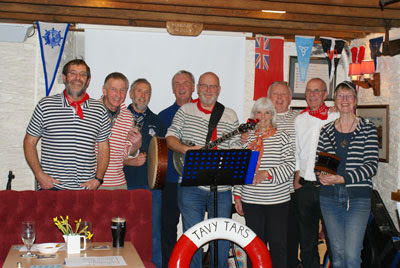 It’s the Falmouth International Sea Shanty Festival on the 15th and 16th of June and the Tars will be there. Details of who is performing where are on the Festival website. On Saturday 29th June we are performing for the participants at an International Convention of Economic Biologists being hosted by Plymouth University. The venue is on the Barbican in Plymouth. It’s a private event but even if you don’t have tickets but you’re visiting the Barbican that evening, you may hear us! You definitely won’t need tickets for the two shop openings we have been asked to perform at by our good friends at Seasalt. (You may remember that we sang at the opening of their new Sidmouth shop in December 2012.) We will be in Lyme Regis for the opening of that store on a date in June, subject to difficulties with planners being sorted out. We will definitely be in Southampton on Wednesday 31st July when Seasalt are opening their new shop within the John Lewis store. (This is proving to be a very popular gig with Tar’s wives).Hear us from 10.30 onwards. Earlier in July (on Sunday 7th) we will be in Teignmouth for what has now become the South Devon Sea Shanty Festival. This has grown out of the Dartmouth Sea Shanty Festival and now covers both towns over the course of the weekend. Teignmouth is a new venue for us, so we are looking forward to that. And finally, the Tars are celebrating their 10th Anniversary this year-in October to be precise. To mark that milestone, we have decided to record another CD and will be in the studio in late autumn, so maybe we will have our first ever Christmas No 1 (in the UK Shanty Charts).